Create distinctive, elegant buildings with our high quality timber, specialty lumber, and true dimensional lumber from BHR Timber Products. We are your source for a wide range of environmentally friendly products from the great forests of the Pacific Northwest. 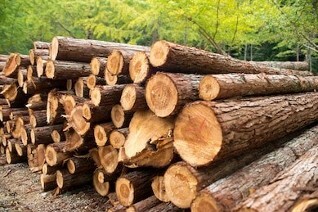 It is our goal to provide the highest quality timber products on the market today. Our #1 FOHC (free of heart center) Douglas Fir offers strength and durability that will last for many years. Our mill direct wholesale distributor ships products nationwide. Find the materials that your clients want. 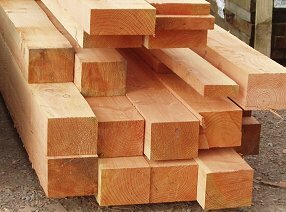 We carry a full range of timbers that can be delivered either rough or surfaced, and we can surface and size stock up to 24' x 28'. Glued laminated timber, or glulam, is a stress-rated engineered wood beam composed of laminations that are bonded together to create an innovative construction material. 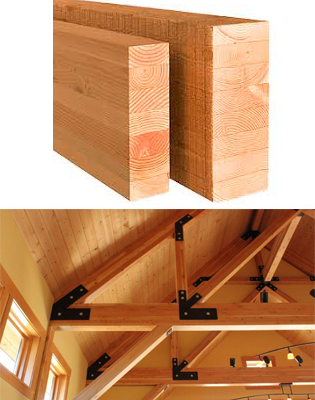 Stronger than steel, glulam has greater strength and stiffness than comparably sized dimensional lumber. Design value, product performance and cost competitiveness make glulam a superior construction choice. When time is a factor, we offer a pre-staining service for our customers using high-quality stains from Sherwin-Williams and Olympic. You choose the color…we do the rest! When quality counts, choose FOHC timbers. 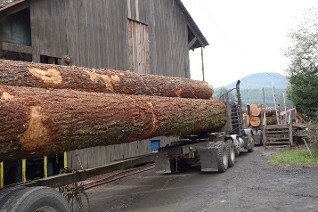 With the Free of Heart Center timbers, all of the growth rings are cut, allowing the wood to dry evenly. This results in a more stable, stronger and straight beam. 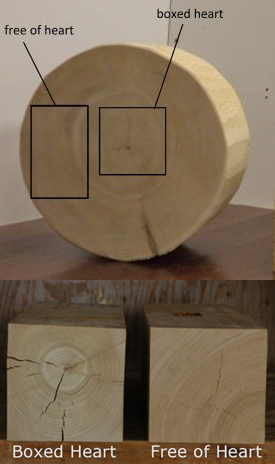 With the boxed heart timbers, moisture inside the rings is trapped, causing twisting, bowing and/or splitting to create a path for the release of the moisture.